The gathering was not the first of its kind (it was the eleventh) and perhaps not of historical importance, but the famous names mentioned in the Times article imbued the account with a certain gravity. The Times reported that attendees included astronomer and author Nicolas Camille Flammarion, who addressed the gathering. Also among the 200 or so in attendance were leading French composer Camille Saint-Saëns, Gustave Eiffel himself, and American astronomer Percival Lowell. Aside from newspaper accounts, there isn’t much of a record of Mme. 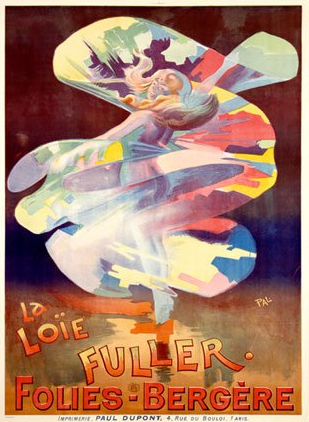 Fuller’s appearance on the Tower that solstice, nor of how she choreographed her 1914 “sunrise” steps. This silent short from 1902 of her performing the “Serpentine” illustrates her style. On another globe which we crossed during the night […] human eyes are so constructed as to be luminous, and shine as though some phosphorescent emanation radiated from their strange centres. A night meeting comprising a large number of these persons presents an extremely fantastic appearance, because the brilliancy, as well as the color, of the eyes changes with the different passions by which they are swayed. Imagine that night, with a cool breeze up there above the hustle and clamor of Paris, that “marvelous dream-creature” turning wildly in her shimmering silks before the crowd. 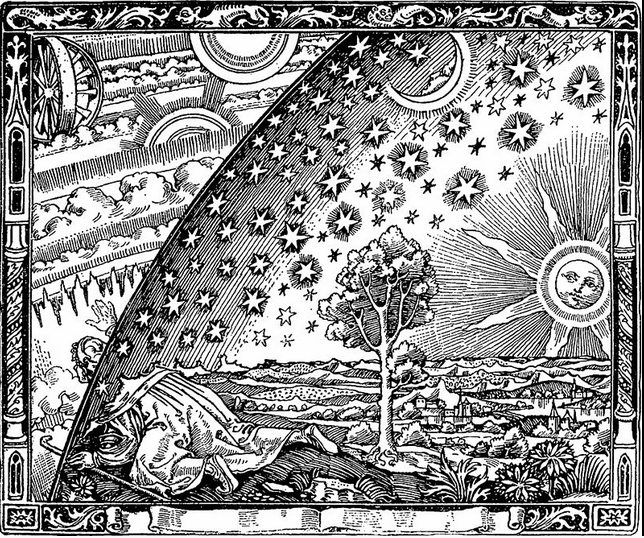 The lights of the city below like Flammarion’s fantastic night meeting of glowing eyes, watching the tower and the sky beyond. It was a moment, a pause. June 28 was less than a week away. Really, really nice. I like the buildup to the 28th, between this and the last historical post. I’m almost anxious about what might happen in five days…100 years ago. I had to take an impressionistic approach because looking at sites and blogs covering similar territory (there are a few) I noticed they were all boring and dry recitations. This was an intensely fascinating moment in history, not just because of the coming war, but personalities like the people mentioned here. Plus not taking some rote day-by-day but really writing about some things is just more interesting to me personally, more fun, and way more of a challenge. I really like the imagery (esp the dancer). I can visualize these vignettes of life around Europe…people absorbed in their events, unaware of what’s coming.